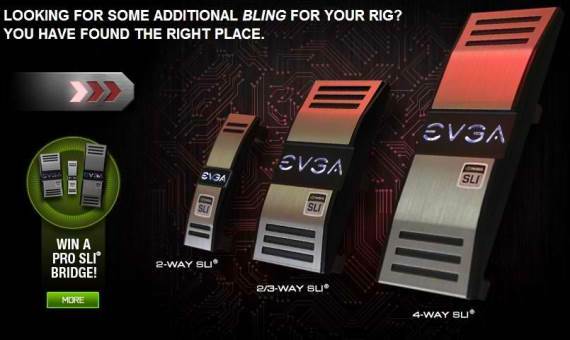 EVGA has recently rolled out a custom designed NVIDIA SLI bridges called the EVGA Pro SLI Bridge. The customized SLI bridges not only connects your multiple graphics card together, but they also add “bling” to your gaming PC, making it look better and cool. The EVGA Pro SLI Bridge comes in three different bridges for 2-way SLI, 3-way SLI and 4-way SLI configurations. If you have a GeForce GTX Titan or any GTX 700 series graphics card, the EVGA logo will illuminate. The EVGA Pro SLI Bridges is available now with a price tag of $29.99 each bridge. EVGA is also currently having a promotion where you can win a Pro SLI Bridge. The Pro SLI Bridges do look cool, but I hope illumination is not limited to GTX 700 and Titan graphics cards only.